At the beginning of the year, I chose joy as the word I would focus on, reflect on, and live by for the entire year. Not only did I want to focus on the joy in my own life, I also want to bring joy to others by performing random acts of kindness throughout the year. So when I learned that one of my mom's goals is to eat better and exercise more, I figured it was the perfect opportunity to use one of my "acts of kindness" to help her. She's been having knee pain, and while she will need surgery, she figures a healthier lifestyle can never be a bad thing when it comes to joint pain. While I want to help her eat better, I also had to include some yummy snacks to reward herself with. 1. I wanted to provide her with some tools so she'd be more inclined to make more meals at home. She's the first to admit that she's been eating out a little too often. 2. 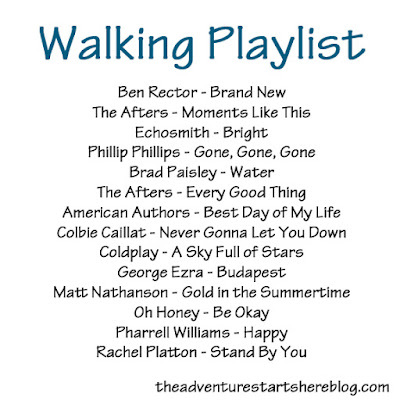 I also thought I could encourage her to take more walks by creating a new music playlist. 3. Finally, I wanted to gift her some delicious treats. When making the goal to eat better and exercise more, I find it's crucial to reward yourself every now and then. In my experience, eliminating treats completely never works, so it's best to have some "better for you" treats in your arsenal. 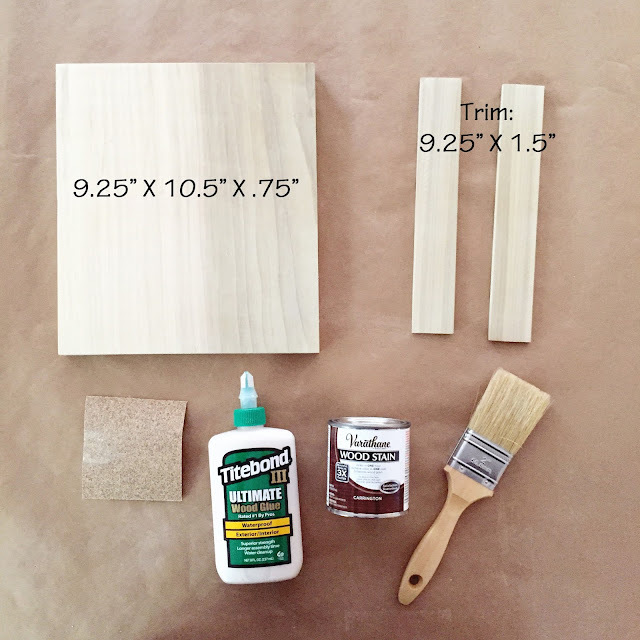 After sanding your pieces of wood, putting the stand together is really easy. You simply put a thin layer of the wood glue onto the side of the trim and attach to the bottom of the large piece of wood so it's perpendicular to it. This acts as the base for your iPad to sit on. Hold the pieces together allowing the glue to set a little. Then take your second piece of trim, and with another thin layer of wood glue, attach it to the first piece of trim. This will be the front of the stand that keeps your iPad in place. Then lay the stand flat (on it's back) and hanging a little off the table so you can attach your clamp. It's best to leave it like this to set for at least 30 minutes... at least that's what the label on the glue told me ;) Once the stand is secure, you are ready to stain. It's best to start with a little bit of stain as it's always easier to add more than to take away. I stained the front of the stand first, let it dry for an hour, and then did the back. It really is that simple! I chose a design that stands straight up because my mom wanted something that didn't take up a lot of counterspace. Even though the stand is at a 90 degree angle, the iPad itself leans at a slight angle when in the stand, so there's no worry of it falling out. Not only did she need a place for her iPad, she also needed an easy way to access all her recipes. Currently, she just looks up recipes online and often asks me to send her recipes that I have made and loved. While I don't mind sending her recipes as she needs them, I thought it would help to have them all in a central location for her. I decided to make a shared Pinterest board with all my favorite recipes that the two of us can also add to in the future. I taught my mom how to access the board, search for new recipes on Pinterest, and how to add to the board as well. 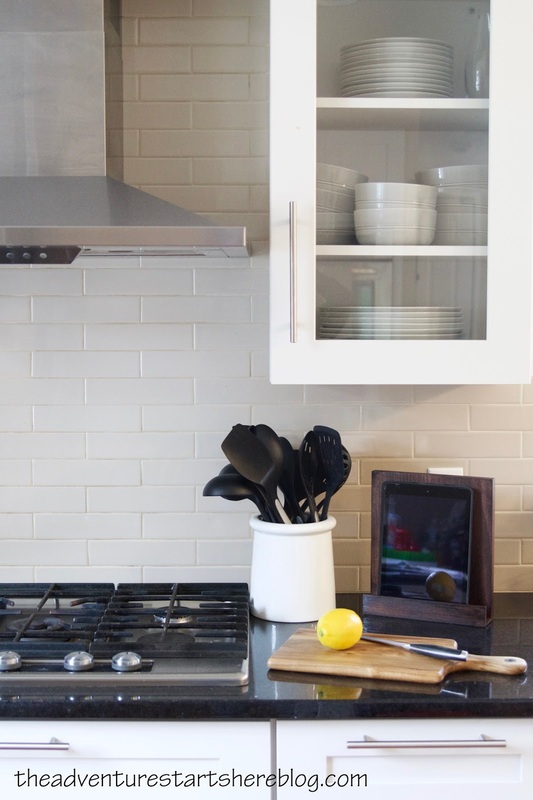 We can now share recipes with each other in a super easy way. Follow Meghan's board My favorite recipes on Pinterest. To encourage her to walk more, I made her an iTunes playlist with some of my favorite songs at the moment. We have very similar taste in music, so I knew she'd like the songs I picked. But the best part, are the delicious treats I gifted her. 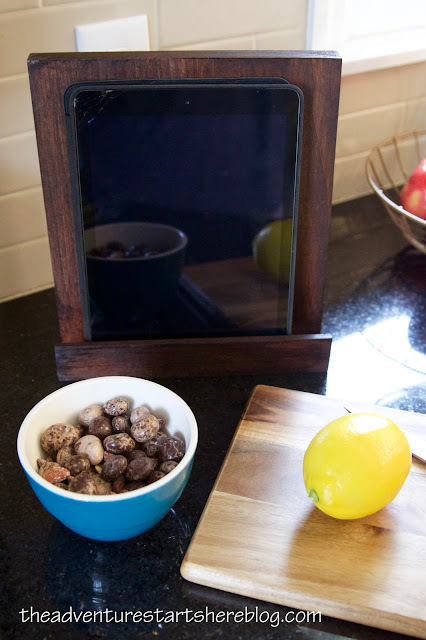 We are both huge fans of fruit, nuts, and chocolate, so how amazing to find a treat that combines all three. I found these new bags of DOVE® Chocolate Fruit & Nut when shopping in Walmart and was immediately sold. When you are shopping in Walmart this month, keep an eye out for the special DOVE® Chocolate Fruit & Nut product displays! Don't they just sound amazing?! I immediately knew they would be the perfect treat for my mom to indulge in while trying to eat better. Not only do they combine the wellness benefits of dark chocolate with fruits and nuts, but they will also help satisfy my mom's craving for something sweet. I personally have found that the best way to help stay on track with a goal to eat better is to incorporate and plan for rewards. And while this was meant as a treat for my mom, she has a generous personality and shared some with me. 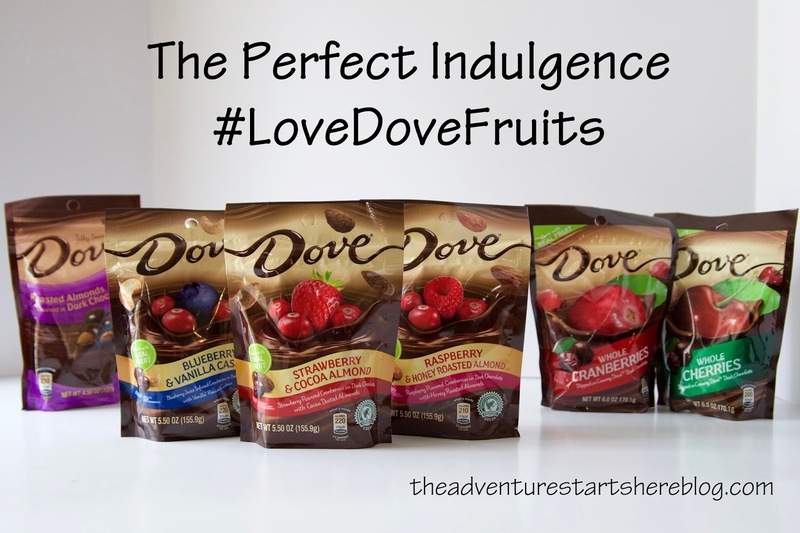 After trying them all, our favorites are the DOVE® Dark Chocolate Raspberry & Honey Roasted Almond, DOVE® Dark Chocolate Cherries, and the DOVE® Roasted Almonds covered in Dark Chocolate. But honestly, every single one was delicious, it all depends on your preference! We were also impressed that just a few pieces satisfied our sweet tooth and filled us up just the right amount. It truly is the perfect indulgence. How do you stay on track and reward yourself when trying to eat better? That iPad stand is amazing...good work!!! That would be a great gift for my mom too. And roasted almonds in dark chocolate...yum!!! Your mom is adorable! And how sweet of you to give her a little stand. And, Dove is my fave chocolate. So creamy. I need some of these. How thoughtful of you!! We love Dove chocolate, the fruit/nut ones look so good. I think small portions to fulfill that 'craving' are helpful to staying on track. Lately, I've been getting my sweet fix from fruit, rather than chocolate/candy, etc. Such a sweet thing to do for your mama. Those treats look really good too! You are so crafty, I love that stand!!! You are such a wonderful daughter! I'm sure she loved all of the treats. 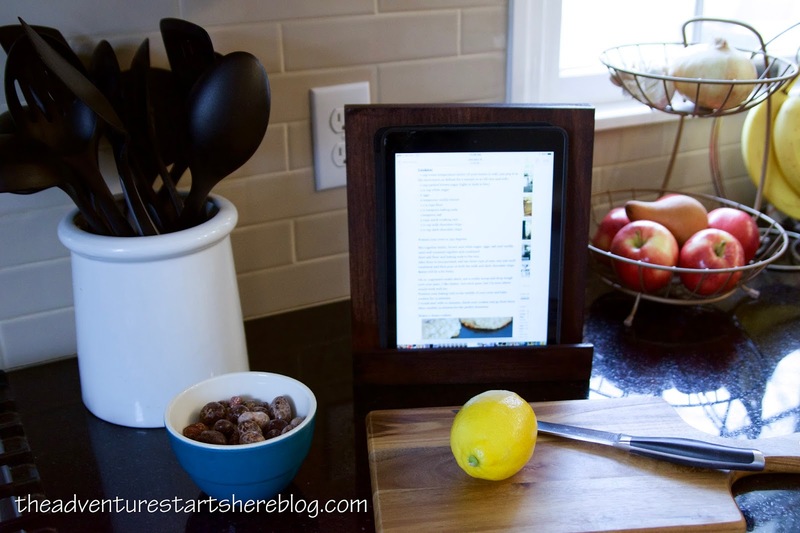 The ipad stand is awesome! Way to go girl! You're so thoughtful! I need a stand like that for when i'm cooking. It's so annoying to constantly have to lift it up to be able to see anything! Your mom is hipper than mine ;) I love how you guys share a Pin board! Ok seriously I have to buy ALL those Dove nuts and chocolate!!! This is great! The iPad stand came out great. So sweet of you to support your Mama so well. I am sure she appreciates it!